The artist’s nephew saw this painting before it was finished and considered it 'a sight quite worth coming from Devonshire to see, I cannot suppose that there was ever a greater Beauty in the world, nor even Helen or Cleopatra could have exceeded her’. He elevated both the character of the sitter and the status of the painting by depicting her as St Cecilia, patron saint of music. The work combines portrait elements – the precisely observed angles and curves of Elizabeth Linley’s face and expressions of the child-angels – with motifs from the world of 17th-century religious and mythological painting, such as the light emanating from the clouds. Although the artist William Beechey (1753-1839) reported that Reynolds had taken greater care in painting the face than in any other picture he ever painted, the appearance of this work has changed dramatically over time. The paint has flaked and subsequent over-cleaning and repainting of damaged areas has disfigured it further. The cracked varnish in the drapery, which resembles the pattern of an alligator’s skin, is probably the result of 19th-century attempts to secure the loose paint by exposing the painting to heat and solvent fumes. 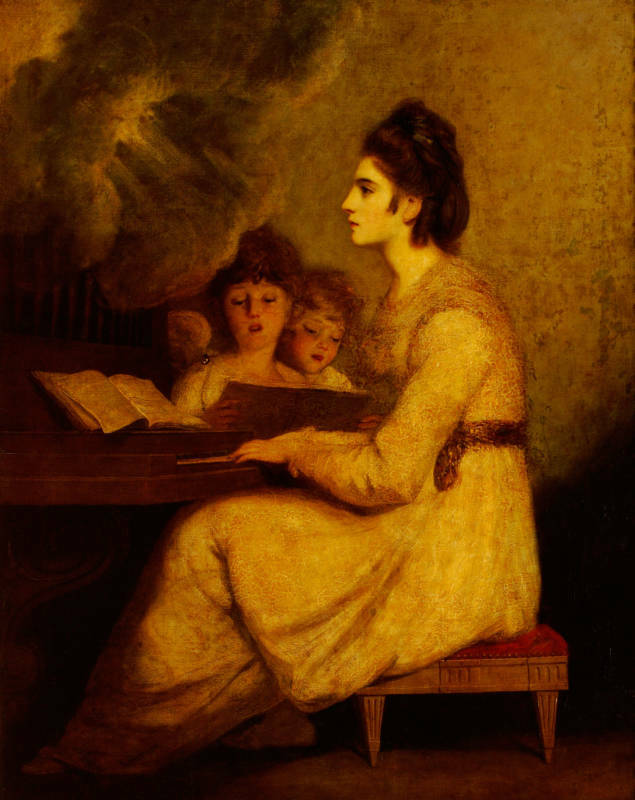 Ironically, the painting has degraded particularly badly because it contains wax, which Reynolds used in an attempt to make his colours last as long as possible. In the drapery, he used oil, then wax and then oil and wax together. He also applied a layer of wax over the oil paint of the face. Reynolds was not the only artist to experiment with wax. Fascinated by the survival of encaustic paintings since classical antiquity, painters, antiquarians and scientists in France and Britain sought to understand and revive this ancient technique, which used melted beeswax to bind pigments.